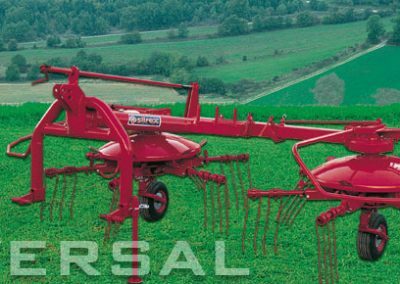 The Sitrex Universal 400 takes combination raking and spreading to much improved level over and above other combination machines. With an adjustable working width of between 3 and 4 metres, this machine will handle the heaviest of green crops. The 4 vertical tines per arm allow this machine to rake as cleanly and gently. When raking, the tine arms are positively controlled by a heavy steel cam track which allows the crop to be released into an even row, as a dedicated rotary rake would, ready for baling or chopping. For spreading, the tine arms are quickly and easily repositioned to a fixed position to spread the crop evenly over a width of 3.5 metres. For transport, it all closes up to a narrow 2.25 metres. The RT range are built for tedding heavy green crops, they are built using heavy duty gearboxes, tines, tine arms and a heavy frame to hold it all together. All machines come with a floating headstock or in drawbar version which both allows the machine to follow contours and corners without stressing the machine. Sitrex tedders are available in both hydraulic and manual fold. This is an ideal machine that will easily cover over 5 metres and can be operated by any tractor over 40hp. The heaviest of lumps that may be present in the crop will be spread evenly with ease. The four large flotation wheels help the machine travel smoothly in rough conditions. 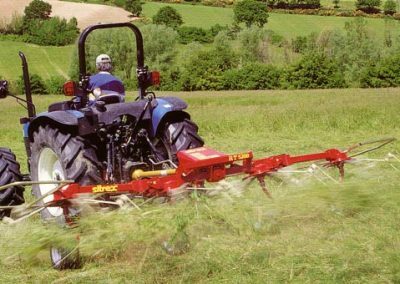 The larger RT5800 will generally spread two 3 metre or even 3.2 metre rows with one pass. This machine can also be handled with a tractor over 50hp. The 8mm wall RHS chassis and extra heavy duty headstock handles the extra width of this machine with strength to spare. The ST780 is available in both 3 point mounted and trailed versions. A very heavily constructed machine designed for spreading heavy green silage crops. Each of the six rotors are able to float up or down independently making them an ideal machine when operating in rolling to flat conditions. This large amount of float is achieved by using 90 degree constant drive joints on the drive shafts of each rotor. The ST780 uses extra heavy 40mm x 16mm tine arms and 11mm tines. On the trailed machine, a tandem wheel set up is used on the middle two rotors which allows the machine to follow contours with ease. The SR has proven to be very popular all over the UK. They are the heaviest machine of this type on the market and are ideal in all working conditions. Aided with 4 wide flotation tyres and a 3D floating headstock, this machine follows the tractor accurately without scuffing from side to side and follows the contours of undulating conditions with ease. The robust folding safety arms help deflect machine away from any obstacles. An oiled filled cam heavy duty gearbox for extra long life and 8 tines per arm for a clean finish are just some of the features that make these machines so popular. These machines were developed and tested in New Zealand in conjunction with the Sitrex factory in Italy. As NZ has some of the toughest conditions and similar to those in the UK, they have been able to develop a machine that is one of the toughest available in the world. A very strong, simple machine with hydraulically adjustable windrow width. The cam gearbox is oil filled and sealed to give maintenance free use and long life. Rear wheel steering gives the machine excellent manoeuvrability. Height is easily adjustable by a hand crank. Each raking unit is able to oscillate backwards and forwards and at the same time move from up and down. The rake supporting wheels are also able to oscillate from side to side. All this allows the machine to operate in some extreme conditions while making a clean fast raking job. When connected to the tractor, the three point linkage headstock transmits the changes in the tractor direction through a steering linkage to the rear wheels of the TW 7800, so that they move in the same line as the tractor. Windrow and working width adjustment could not be any easier than with the TW 7800. A hydraulic control rapidly widens the two side rotors, thus it is possible to adjust the windrow width to that of the baler or other machine used for harvesting without having to leave the tractor seat.